Human Capital Strategies launched in 2007 and has grown quickly to become an industry leader. When a company considers itself to be good, they tell everyone. But when an outside entity acknowledges that company, it’s time to shout it from the rooftops. 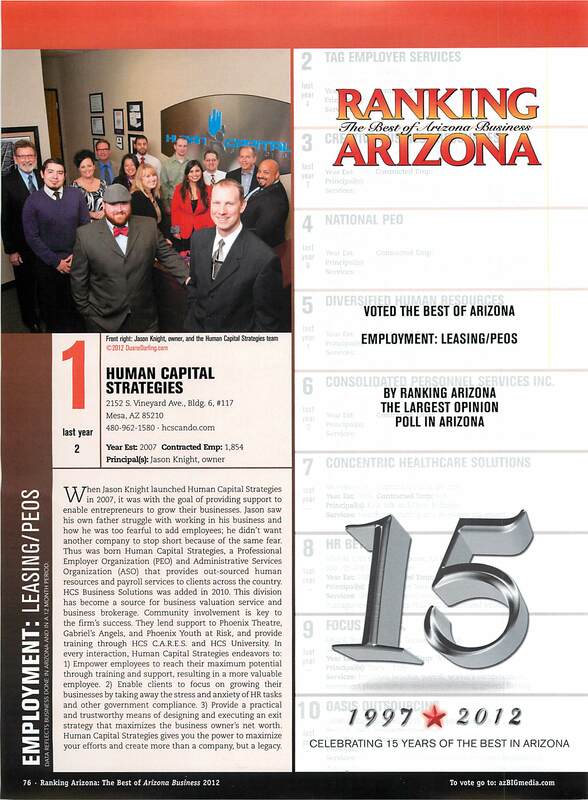 Such is the case for the Mesa, Ariz.-based Human Capital Strategies, which was recently ranked as the #1 employment: leasing/PEO company in Arizona by Ranking Arizona. Each year, Ranking Arizona asks the public to rank the best-of-the-best across the state in a variety of categories. Voters visit the website to cast their ballots for companies of their choice. Human Capital Strategies has been on the list for a number of years, moving up a bit with each flip of the calendar. In 2011, the company was ranked #2, and this year, they cracked the coveted top spot. While some may call the listing a popularity contest, companies don't become popular without loyal customers and raving fans. Human Capital Strategies falls into that category. By building a customers-first philosophy, the company has distinguished itself. “I am humbled by this honor, and I would like to express heartfelt gratitude to our clients and supporters across the years,” shared company founder Jason Knight.